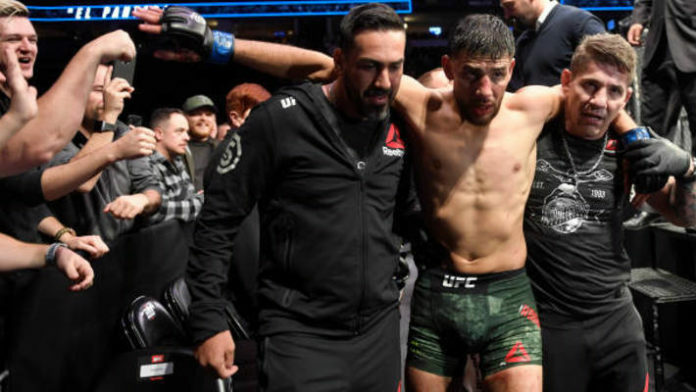 The UFC Denver medical suspensions are in and as expected, the event’s headliners have not walked away unscathed but the winner ended up taking the brunt of the damage. Yair Rodriguez and Chan Sung Jung did battle inside the Pepsi Center in Denver, Colorado this past Saturday night (Nov. 10). “El Pantera” pulled off a spectacular upwards elbow to knock the “Korean Zombie” out with just one second left in the fight. Rodriguez is facing a 180-day medical suspension from the Colorado State Boxing Commission. Jung has received a 60-day mandatory suspension. Maycee Barber is also looking at a six-month medical suspension. Barber had a dominant performance over Hannah Cifers, but she must be cleared by a doctor if she expects to return before 180 days have passed. Mike Perry has the second longest suspension on this list at 90 days following his submission loss to Donald Cerrone. Like Rodriguez and Barber, he can be cleared beforehand by a doctor. Do any of the UFC Denver medical suspensions stand out as surprising to you?